Warning, eyecatcher! Striped, opaque over-knees that come in tons of different colors! Our selection of over the knee socks comes with a variety of attributes: cheeky, rebellious, stylish and yet girlish and playful. This is exactly why these extra-long knee-high tight outfits make for fashionable and attractive eyecatchers. Whether in plain colors, plaid, stripes, dotted or crocheted, we offer you high-quality over the knee socks from well-known manufacturers in a variety of styles so that you can emphasize your style with the appropriate over the knee socks. The materials and designs come in numerous combinations. 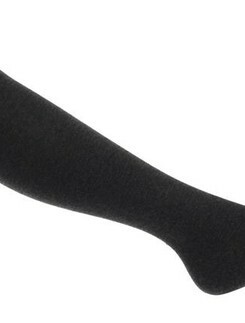 Even if simple knitted fabrics fulfill your need to stay warm, a stylish look can be created with over the knee socks. That is why there are also variations of fishnet with playful or color-contrasting details. You can also find the footless version in the form of a long cuff or leg warmer. In addition, we also offer items that can be used as accessories to funky Halloween costumes.